Over the last year, I have experienced so many wonderful things whilst developing GiveMeTap. It has confirmed to me on so many levels that the one thing we can all count on is that ‘change is the only constant’. There is nothing entirely permanent in this world and that goes for almost everything. So it’s no surprise that GiveMeTap has been evolving, growing, learning and adapting to help benefit you (our wonderful GiveMeTappers) and the people we help to get access to safe drinking water. 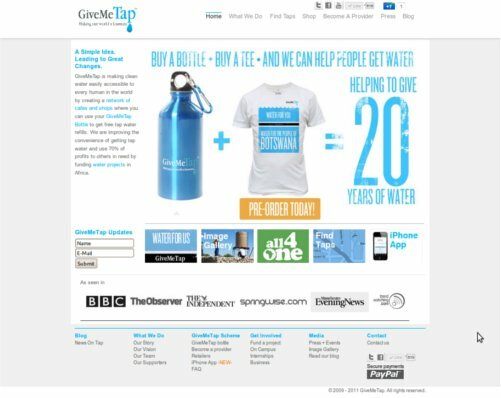 Back in 2009, when I originally had the idea for GiveMeTap, I wanted to make sure that technology was used in the right ways to help people easily access water and then harness collective people power to make a change, which was to 'redefine the way we consume water’. This started with me building the first GiveMeTap website in about two days (sadly, I did not take a picture of the site). 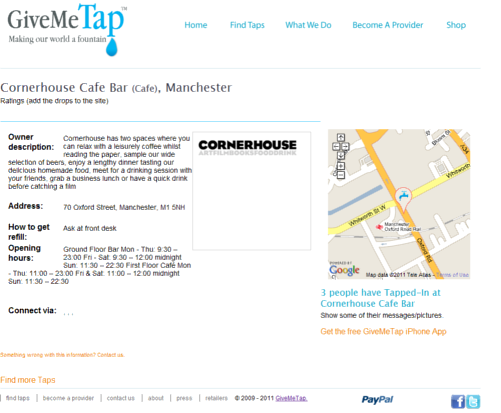 Within four months, a new site was released and this become the face of GiveMeTap for the last year or so. After appearing in The Observer, I was contacted by an absolutely phenomenal creative design agency called Squint Opera who said that they’d love to help GiveMeTap grow by helping to improve our design and content. I was getting used to the face of GiveMeTap, but as I originally stated 'change is the only constant’, and so I put aside my attachments to the website that I had spent painstakingly long hours developing, to explore new possibilities. What we found was exciting! Using some of the inspiration I acquired from the journey with Squint Opera, version three of GiveMeTap was released five weeks ago. This had aesthetic improvements, which included a new image show-reel on the home page. In the next few weeks, we’ll be detailing some of the changes made. Leave a comment below with your thoughts on the new website design.